Blood-clotting protein. 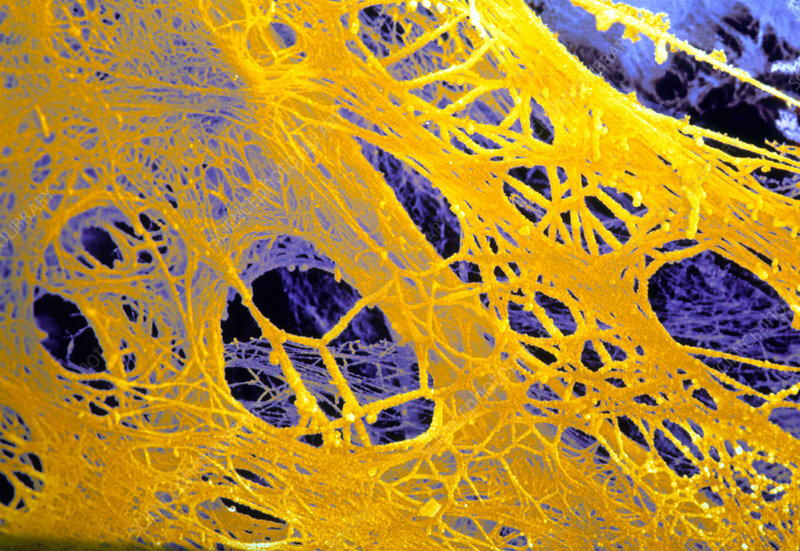 Coloured Scanning Electron Micrograph (SEM) of strands of pure fibrin, the protein which causes blood clots in humans after an injury. The insoluble fibrin forms a mesh which traps blood cells and seals the damaged blood vessel to prevent bleeding. Blood clots are triggered by chemicals released by platelet cells in the blood or by tissue cells at the injury site. These chemicals begin a complex series of chemical reactions in the blood which result in the formation of fibrin. Fibrin is used in surgery as a biodegradable "glue" for holding tissue together whilst it heals. Magnification: about x4,000 at 5x7cm size.